Long time knitters know that you need to understand your yarn labels to know how to make & take care of the things you knit. Even beginning knitters need to know what all the little symbols and weights and dye lots (etc.) mean to be a successful knitter. 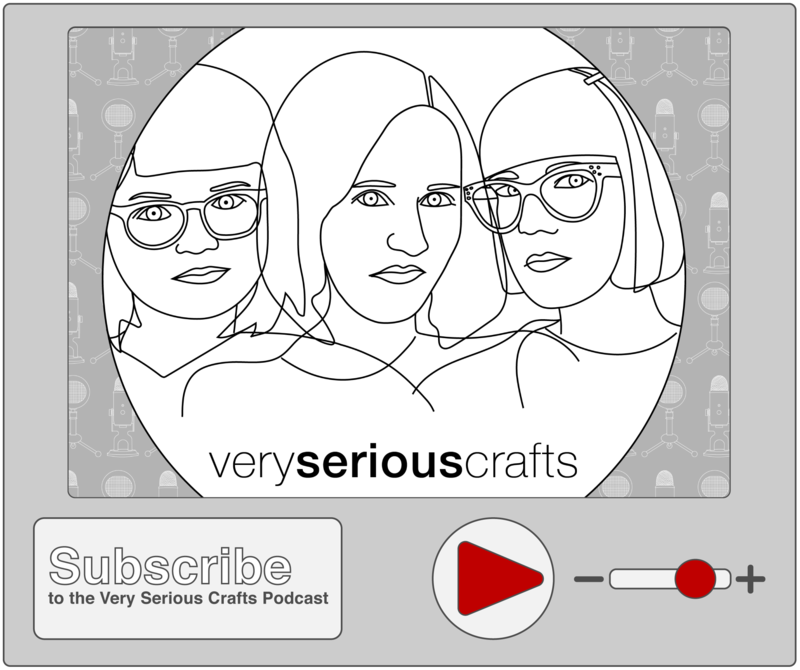 Today I’m going to go over what to look for in your yarn labels, whether you’re looking at big box craft store yarns or indie handspun & dyed yarns. It’s not the most glamorous part of knitting, but knowing this stuff will save you a LOT of headaches when you cast on your next project. The big things you need to look at when choosing yarn for a project are: fiber content, gauge, the amount of yarn per skein, color information, and dye lot. What are each of those things? fiber content – What’s the yarn made of? Acrylic? Wool? A silk/wool/linen combo? Is it ethically sourced? 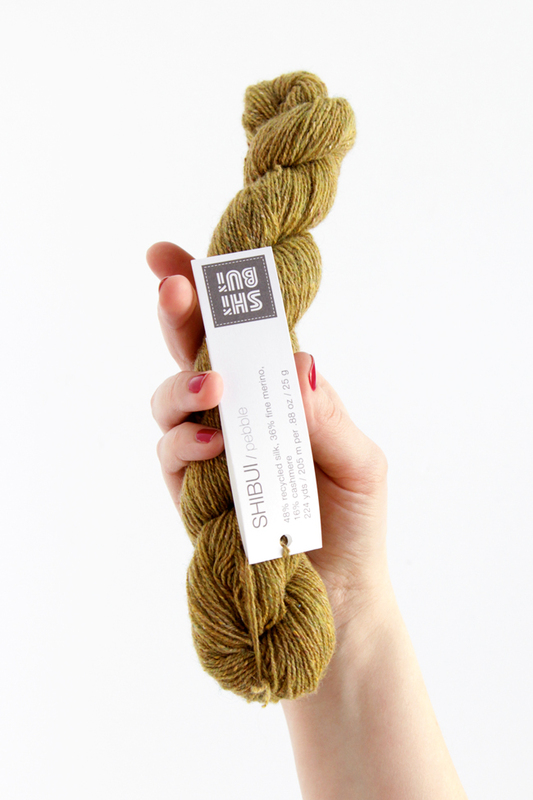 amount of yarn per skein – How many yards/meters/grams/ounces come in this package of yarn? You need to know this so you buy enough for your project. 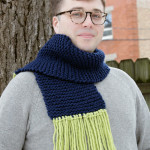 If you’re knitting a sweater, you’ll need more yarn than if you’re making a cowl. 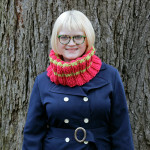 Published patterns will often list how much yardage or meterage you’ll need to knit them. color name/number – Much like paint colors, yarn color names can be kind of silly or romantic, but they’re good to know. care instructions – How should you wash something you make with this yarn? Can you wash it? Should you lay flat to dry? 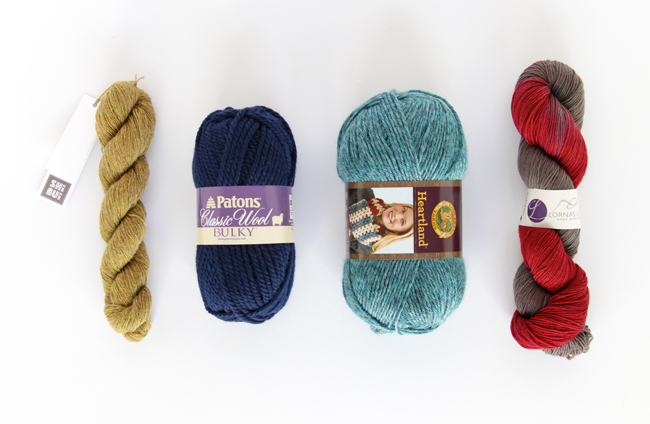 dye lot – Even though you might be holding 6 skeins of yarn all called “marsala monsoon,” they might not really be the same. Subtle differences in color happen in the yarn dyeing process. So when you’re knitting that sweater that calls for 6 skeins of “marsala monsoon,” you’ve got to check the dye lot to make sure they’re all really the same color. 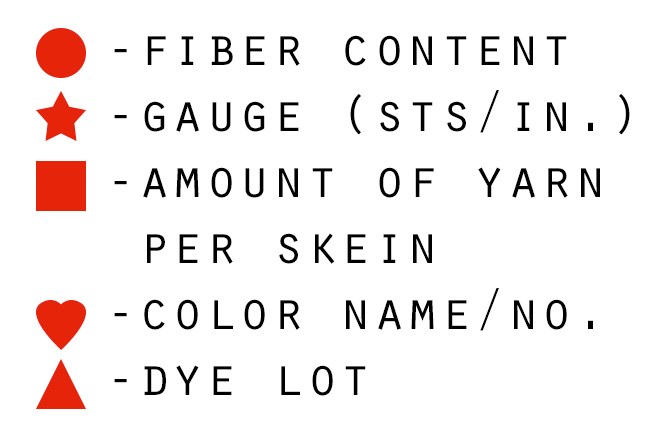 The dye lot will often be a series of numbers letting you know which batch of yarn they were dyed with, a.k.a. which dye lot they’re from. *I’ll be doing a whole post on gauge soon, so if you’re like “whaaat?” when you read the definition about gauge, don’t worry. It’s important, but not a deal breaker if you’re a new knitter/crocheter. Honest! In the knewbies (knitting 101) supplies post, I included a graphic saying which symbols to look for on your yarn label. The first few shots here are of Patons Classic Wool Bulky Yarn, the yarn I’ve been using in the Knewbies posts so far. Color and dye lot information can most commonly be found near to the UPC code on mass market yarns like Patons, Red Heart or Lion Brand Yarn. 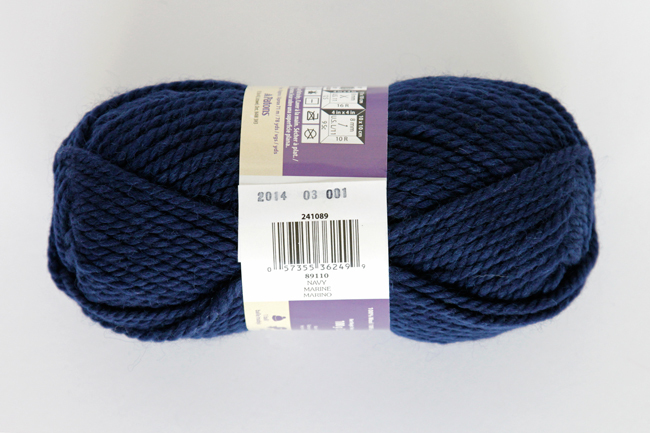 This yarn, for instance is called Navy (easy enough) and its dye lot is 2014-03-001. The dye lot is stamped on this yarn’s label, but sometimes dye lots will be printed on labels. You just need to look near the color name and UPC code. Many yarns also have color numbers that correspond to each color name. 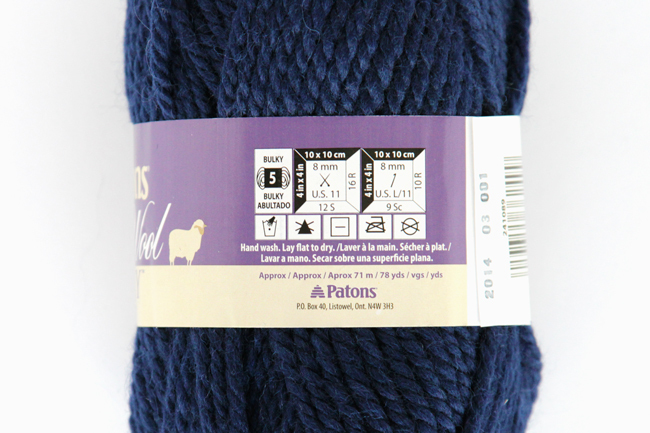 This navy yarn’s number (and pardon its blurriness in the photo) is 89110. Just like the dye lot and color name, the number is located near the UPC. Fiber content and weight. 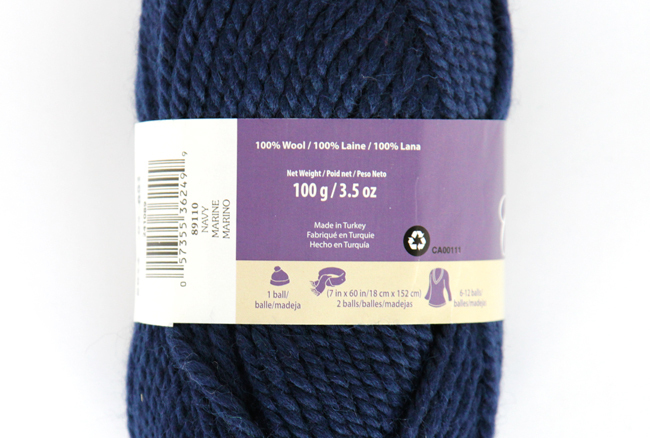 Here, you can see that this yarn is made of 100% wool and each skein’s net weight is 100g/3.5 oz of yarn. Gauge, care instructions & yardage. An important concept to take away from this post is that many yarn labels are designed by graphic designers, who aren’t necessarily knitters. Take this label for instance: rather than have the yardage next to the weight, which I personally think is more logical, the yardage is listed under the care instructions. Not all labels use commercial laundry symbols like this one. For those that do, you can use this guide to home laundry labels, which may also be used for laundering any clothing item featuring the same symbols on its tags. Here is the skein of Patons Classic Wool Bulky and a skein of Lion Brand Heartland yarn. 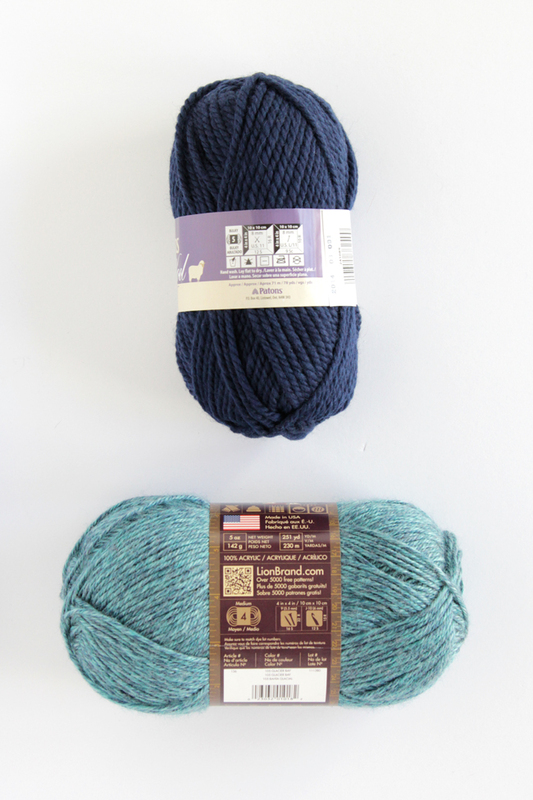 Even in this zoomed out photo, you can see that even though both labels are conveying the same type of information about the yarn they’re wrapping, the graphic design and layout of that information is different. Just carefully read your yarn labels before purchasing, and remember to look for dye lot, needle size, etc. so you don’t accidentally buy something inappropriate for a project and end up back at the store the next day. Sidenote: What’s a hank? 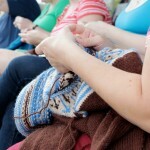 How is it different from a skein? A lot of indie/smaller yarn companies sell their yarn in what’s called hanks, the twisted loops of yarn you see in the following photos. I usually just call all wads of yarn skeins out of habit, but skeins are usually an oblong shape and don’t need to be wound into a ball before using in a knitting project. Hanks, when untwisted, are just large loops of yarn that need to be wound into balls before knitting a project with them. Just FYI. 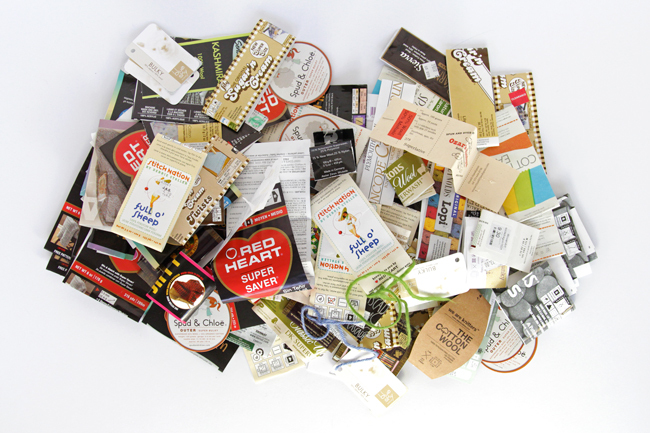 As you saw above with even the mass market yarns, there’s no consistent labeling system across brands. You just need to know what to look for. This key shows some symbols I’ve overlaid on the yarn labels so you know what each thing means. See? This label for a yarn you’ll often find at independent yarn shops is very different than the Patons and Lion Brand labels above. 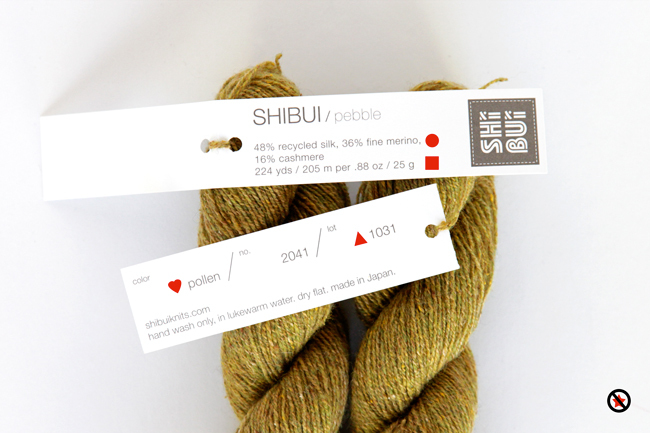 This is the Shibui yarn company’s Pebble yarn. This label simply lists the fiber content (48% recycled silk, 36% fine merino, 16% cashmere), yardage (224 yds), color (pollen, #2041), dye lot (1031) and care (hand wash only, etc.). It doesn’t list gauge. 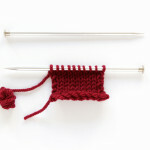 If you’re a longtime knitter/crocheter or want to make something with a particularly loose or tight weave, you’ve probably learned that knitting your own gauge swatch** is important to getting the right size/fit in your finished object. For personal projects, I often only use gauge -when it’s listed- as a general guide for how many stitches to expect, but I always knit my own test swatch to see what gauge I’m actually knitting at. For fine projects like the ones I’d be making with this yarn, gauge can start to vary a lot when you’re getting 6+ stitches/inch. **Again, gauge swatches are a topic I have planned for another day. 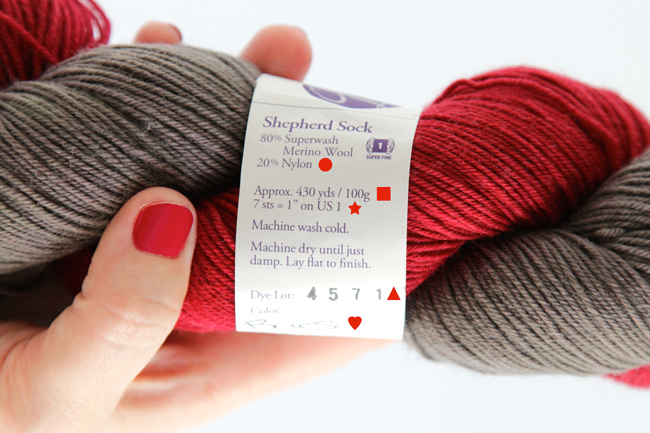 Looking at a smaller yarn company, this is the Shepherd Sock yarn by Lorna’s Laces. This yarn is hand dyed and hand packaged, down to the handwritten colorway, which is at the very bottom of the label in the picture – yarn labels are hard to photograph, guys! This label is less minimal in design than the Shibui, but here are the specs: fiber content (80% superwash merino wool, 20% nylon), yardage (430 yds), weight (100g), gauge (7 sts/in on size US 1 needles), care instructions, dye lot (4571), and color name (Bucs). If you’d like to read more about yarn labels, I recommend this post from the Craft Yarn Council. I wish I’d found such a clear and informative post when I was a new knitter. This is SUPER helpful and well laid out. Great work. Being a crocheter, too, I have tons of labels! They were taking over the closet, so I came up with a system of sorts. When I have a new skein/hank of yarn, the first thing I do is cut a small piece of the yarn and tape it to the label. I make sure that the information is not covered up in any way. I store them all, for now, in an old Kaboodles makeup case. I started taping the small piece of yarn to the label when I realized that sometimes when trying to figure out what yarn colour went with another colour, it was easier to look at the little yarn pieces than trying to match up colours with each other on the internet. Once again, thank you for this knewbie class! Thank you so much for this great explanation! I have just started to give crochet a try, after failing miserably at learning to knit years ago….so far I have four stitches down! Ha! :) This is an awesome resource that I know I’ll be referring back to many times. Thanks again! Very valuable information. I’d like to see information on substituting yarns. Love your site! 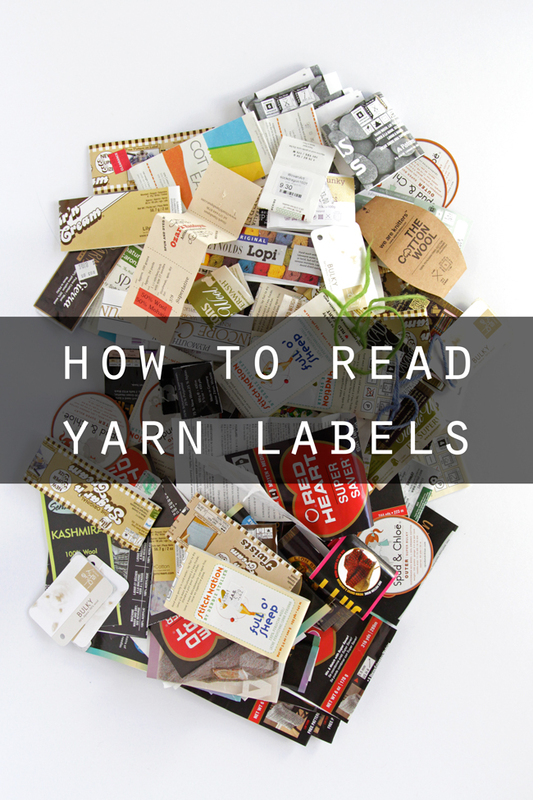 If you know how to read a yarn label, you have every thing you need to swap out yarn in patterns! :) Always remember to check the symbols & needles called for.